Last week in Albany, we released a report that finds that horizontal hydrofracking in New York State is likely to produce significantly higher amounts of radioactive waste than previously believed, and that the NYS DEC has not demonstrated the ability to properly analyze the potential impact of radiation exposure or take adequate steps to protect the public. Once radioactive material comes up out of the ground along with the gas, the problem is what to do with it. The radioactivity lasts for tens of thousands of years, and it is virtually impossible to eliminate or mitigate. Sooner or later, it's going to end up in our environment and eventually our food chain. It's a problem with no good solution. According to the EPA, exposure to radium increases the risk of cancer. 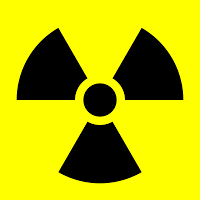 Radium also decays into radon, which is the second leading cause of lung cancer. The EPA has been extremely critical of New York State's plans for dealing with the radiation from fracking, but no one seems to be paying much attention. So we commissioned the report. The report, Consideration of Radiation in Hazardous Waste Produced from Horizontal Hydrofracking, was authored by Ivan White, a career scientist with the Congressionally-chartered National Council on Radiation Protection. There he helped develop computer programs for radiation risk assessment and assisted in the formulation of national policies on radiation protection for civilian and military personnel. "Radioactive materials and chemical wastes do not just go away when they are released into the environment. They remain active and potentially lethal, and can show up years later in unexpected places," writes White. " They bio-accumulate in the food chain, eventually reaching humans. Under the proposal for horizontal hydrofracking in New York State, there are insufficient precautions for monitoring potential pathways or to even know what is being released into the environment." See our new flyer on radioactive waste.